Last Update: 5 November 12; Columns: 2; Compatible Browsers: IE7, IE8, IE9, Firefox 3, Firefox 4, Safari 4, Safari 5, Opera, Chrome; Software Version: WordPress 3.0; Documentation: Well Documented; High Resolution: No; Layout: Fixed; ThemeForest Files Included: Layered PSD, JPG Image, CSS Files, JS Files, PHP Files; Widget Ready: Yes. VisualMedia is a throughout professional premium Wordpress Theme which is perfectly suited for company sites and private or commercial blogs and showcases. If you are looking for a sleek and professional high quality theme, VisualMedia is for you. - This update fixes some bugs, like the footer. - This update fixes some bugs and typos. - This update adds multimedia functionality to visual media. As more than 30 files changed, we recommend you to update the whole package! Check out the menu and the “more” buttons in the preview! They have a very nice and smooth 3D fade effekt! - An incredible backgound/foreground double slider will blow you and your clients away! We use the power Wordpress 3.0 has to offer! Yes, we have a custom Google Maps widget! And it works without API code! Our previously clients love this feature: Populate the mainpage by just dragging and dropping widgets in the mainpage widget area! We created a variety of incredible useful widgets for you to choose from. Take a look at the preview to see what VisualMedia has to offer! The widgets are waiting for you in the widget area of the wordpress backend. If you hide it, the post will take the full side width! Perfect for the inbuilt gallery and portfolio systems! This is perfect for a magazine (and every other site!). Because you can create unlimited sidebars, we have decided to bring a purpose to it. You can select for every post a sidebar that will be displayed below it. You can even use our premium widgets, like tabs or articles. Do you have a lot to say or simply don’t want that big sidebar? No problem: you can make any post full width! What is better than a moving picture when it comes to learn something? We created some quick videocasts to show you how to setup and get started with VisualMedia. - Massive code base: With over 6300 lines of custom php code, this template was written by pros who do a living with coding. +People Premium Business WordPress Theme; Blogga - Team Blogging for WordPress; The Firm - Simple Company WordPress Theme; MediaFlex - Unique Wordpress Agency Theme; Event Guest List WordPress Theme; Stella - Newsletter for Restaurants, Cafes, Yoga ; Rokko:Business & Portfolio Premium Wordpress Theme. Keywords: blog, corporate, creative, elegant, extraordinary, gallery, magazine, outstanding, personal website, portfolio, showcase, slider, unlimited shortcodes, unlimited sidebars, video support. Premium ThemeForest VisualMedia Special FX Wordpress Theme 138329 WordPress Themes, Website Templates, Mobile Themes, Flash Templates & Scripts from creative professional designers. 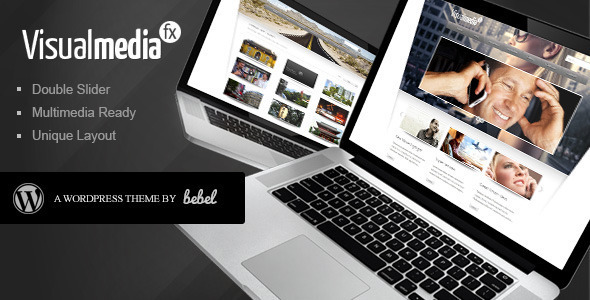 Full details of ThemeForest VisualMedia Special FX Wordpress Theme 138329 for digital design and education. ThemeForest VisualMedia Special FX Wordpress Theme 138329 desigen style information or anything related.